Protestors at the University of Missouri in October 2015. Photo courtesy of Flickr user KOMUNews and used here under Creative Commons license. 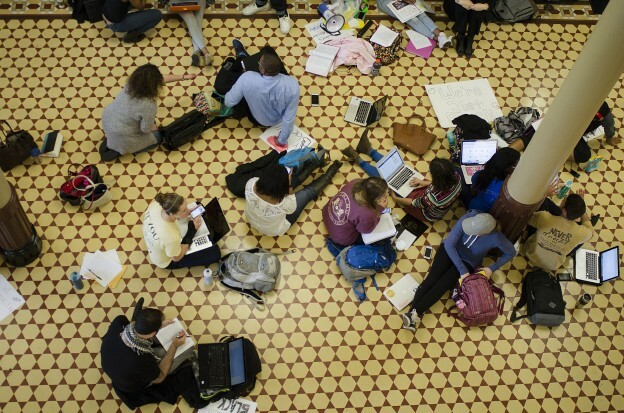 As student protests over diversity concerns at the University of Missouri led to the resignation of two top administrators this month, the story drew national attention. Yet the historic nature of the protests dimmed almost as soon as it hit our screens, muted by a controversy over journalists’ access to the protestors’ encampment and the role of faculty and administrators in keeping them out. It all happened in the home of one of the most widely noted — iconic even — journalism programs in the world. Yet the issues seemed more nuanced that the headlines dominating social media. EdShift offered a few writers the chance to look through a longer lens on the events last week at Mizzou. What do they draw from what they heard and read and how might that help journalists and journalism educators and students learn and do better?